There aren't too many options in Chico when it comes to fishing during the off-season. The Sacramento River is the closest moving body of water that is open until the trout opener in April. In order to compensate for the lack of fishable moving water, I've discovered a few lakes and ponds around Chico that are difficult to fish but produce quality catches. After fishing the Tiechert with no success I spent the rest of my day at Horseshoe and was finally able to get my first carp of the year. I fished the pond in the afternoon during a nice warm overcasted day hoping that the fish would be more willing to eat. I spent about three and a half hours float tubing the pond with just nibbles. There usually isn't weed growth this early in the year but with the current warming trend the weeds were beginning to mat. I threw frogs at first then streamers but to no effect. There were damsel flies hatching which had me thinking more like a fly fisherman. As I floated the pond, I watched a few bluegills and bass jump to try and catch those annoying damsels. The fish were definitely on them. I kicked myself for not bringing a few dries so instead I tried fishing a wiggle bugger. Nothing but small nibbles today. Needless to say I'll be bring a few damsel fly patterns for the next time I'm out there. After getting smacked with the skunk stick, I wanted to end the day trying one more time. I was targeting bass and catfish but I've found that they tend to be more active late morning to noon. I switch targets to carp for about 10 minutes before sunset. They were scurrying about in the shallows but I couldn't tell if they were feeding or not. I tried and tried until I stopped to think for a second. Maybe I should just target fish that I see make ripples and I did just that. I targeted several fish before I saw a new target about 20 feet away from my position. I crept over slowly to get a better angle and made my first cast. I slowly stripped my line in but no reaction. I made my second cast just about 6 inches away from her rippling. I slowly stripped my line in... I stopped my fly in the center of her ripple... My line tightens and she bolts off! YEAH BABY! I fought her for a few minutes as other anglers watched. 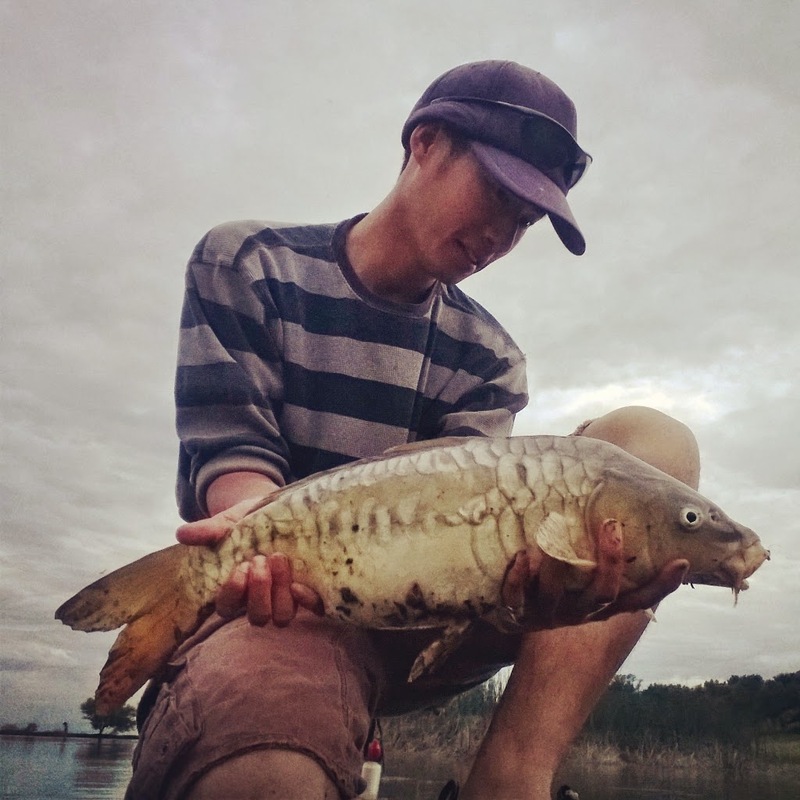 To my surprise it was a mirror carp, a subspecies I haven't caught yet. Not the biggest carp I've caught but definitely exciting. Congrats bro, I'm sure that was a fun fight! I have yet to catch a carp on the fly!